My mum Alice Hose (known as socks) has loved the VE Day celebrations on TV this weekend. She worked at Fort Southwick and was billeted at a house in Fareham. This weekend she told me that she knew on May 5th 1945 that WWII was coming to an end because she worked in the cypher office with Barbara(? ), and had typed the deciphered message that hostilities were to cease on May 8th. When I asked why she had never mentioned this before her reply was... I signed the official secrets act! My brother -in law who lives in Emsworth regularly sends me items from the Portsmouth News. I recently read an article 'Tunnel Vision' and it brought back many memories. I was born in 1932 on Moneyfields Road in Copnor but when war was declared we moved to Portchester and then to Paulsgrove in 1943. Living on Raymond Road I could see from our back garden the entrance to the tunnel under Fort Southwick. I remember well seeing the guards at the entrance with their Tommy Guns. The entrance was always very busy most days. My friends and I would climb up from our home until we came to the barbed wire and then the guards would call out and tell us to go back home. This area was busy during the Normandy Invasion and the Americans would park their tanks on the road outside our home and along the seashore near Bert's Cafe and Vospers. The Paulsgrove Chalk Pits were one of our favourite playgrounds and where we shot our cap pistols at each other. Your website is fantastic and I will enjoy its contents in the days ahead. You have done a great job in collecting and narrating this information. I have sorted through my late mum's photos and found a few photos of Fort Southwick. They are originally from 'Evening News & Hampshire Telegraph Portsmouth', circa 1944. My mum was Leading Wren Mollie Carter (later Mollie Whelton) - 93270. 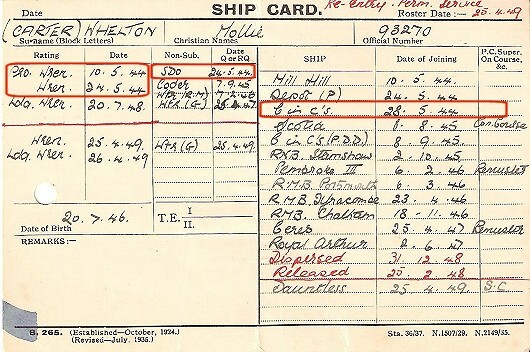 Mum was also attached to HMS Collingwood and in a ship's card there are others mentioned - mostly training I think. Mollie Carter (later Mollie Whelton) - 27 Feb 1945. Note the 'Signals' trade badge on her right arm. Mollie Carter's Ship's Card. According to this she joined the service on 10 May 1944 and spent 2 weeks at the London Mill Hill training school as a probationary WREN. After 4 days at a holding depot (P) she was posted to C in Cs - (Commander in Chief) Fort Southwick on 28 May 1944. This was just 9 days before D-Day. Her rank was now WREN and she served in the SDO - Signals Distribution Office. She was about to take part in the most important episode of WWII with just 27 days experience under her belt. She left the UGHQ on 7 August 1945 - 3 months after Victory in Europe. The Signals Distribution Office where Mollie worked. 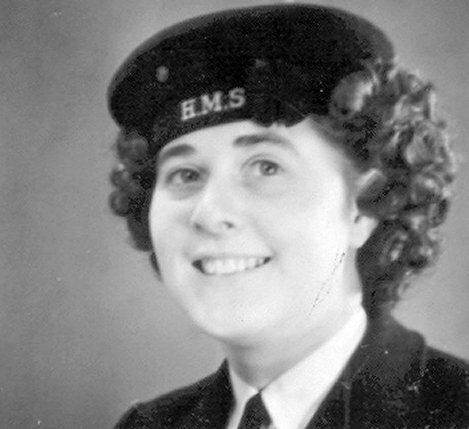 My dearest Mother, who passed away on 10 November 2006, was a WRN [Women's Royal Navy - sometimes spelt WRNS Women's Royal Navy Service] at Fort Southwick. She was a Switchboard Operator and was there on D-Day. Some of the names you have mentioned, I have a picture of them, from another source. 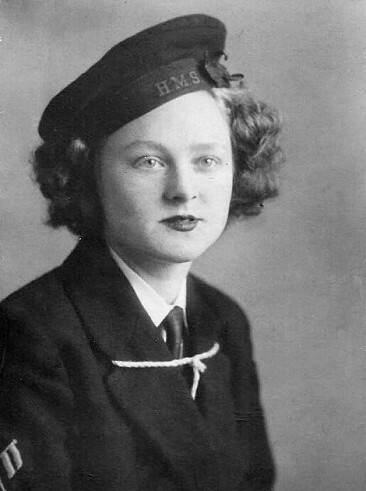 I also have one of my Mother in her WRNS uniform. WRENS who served in the wartime UGHQ with captions. 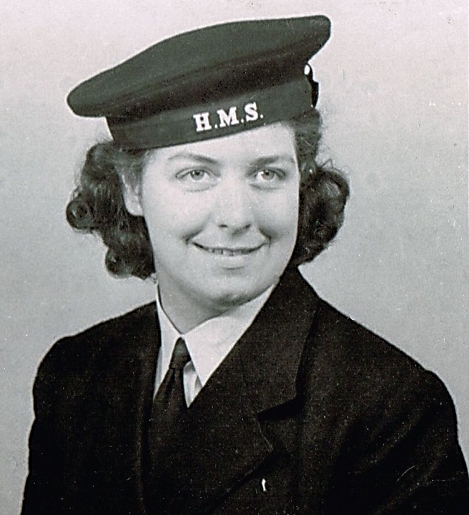 My Mum's time of very dedicated service was from 26 April 1944 to 21 August 1946 and she was always as "proud as punch" to have served in the WRNS. Everyone had a vital part to play during the WWII. I am also sending a photo of Sarah "Skippy" Wilson (as she was known then at Forth Southwick - now Mrs Robinson) and attaching one of several poems she wrote during those days. She was a friend of my Mother, Mary Deacon Pickles. This poem was one of several written by Sarah, and was submitted to the “WREN” magazine recently. Sarah Robinson (nee Wilson) has written in a letter to me that at Fort Southwick, there were 167 steps down to where they worked in the Tunnel – it was all communications. When they had a ten minute “stand down” for a cup of Kie (chocolate) and a “Corned Beef Sarnie”, they were permitted to go outside on the side of the Hill, through an escape door. That is where she thought up the poem, thinking about all the lads then being killed in Normandy. Sarah 'Skippy' Wilson, and below is her poem. It’s bustling with life down below. Passing signals and codes CHQ. And inside a busy beehive. After my Mother, Mary Deacon Pickles passed away, I had contacted several of the names in her address book. On going through her papers, I also came across a letter from a lady named Ms Deirdre L Condon, who back in 2003 was trying to find fellow WRNS of her Aunt, Ms Audrey Jackson (top row left in the picture [see below]). She published a letter in the WRN magazine several years ago and as a result, received two responses from fellow WRNS of my Mother and her Aunt. These were from Maria Scott (nee Garcia – top row second left) and Sarah Robinson (nee Sarah “Skippy” Wilson – a photo of whom you already have on your site). Mrs Robinson had given Ms Condon my Mother’s address, and so she wrote to her with a copy of photos of her fellow WRNS, together with a letter explaining what happened to Audrey Jackson. Ms Jackson had left her photo album with her then 18 month old niece, which she has cherished since and was kind enough to send me a copy of the relevant fellow WRNS. My Mother had apparently often wondered what had happened to Audrey Jackson and was told that she married an Afrikaans soldier and emigrated to South Africa, but sadly passed away due to a post operative infection not very long after the War. I do hope you can put these photos on your site also, so that perhaps family and any fellow WRNS of these ladies who are still with us, can recall the special memories with their friends. 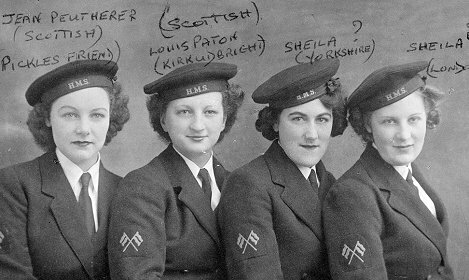 WRNS who served underground during 1944 at the Fort Southwick UGHQ. Thanks for your wonderful efforts in keeping their memories alive. I have only just discovered your website through worldnavalshipsforum. I was interested to see the mass of information about the area because I grew up in Portsmouth and Portsdown Hill was our escape, because we lived in Stamshaw but my parents came from Hartley Wintney, Hampshire, and missed the countryside. My particular interest was in the picture of the unidentified WREN [see ??? above], because I think she might be my cousin, Peggy Harwood, who was there during the D-day period. I have been trying to find any of her contacts but, by now, they would of course be in their 80s and I have had no success. She came from Bedfont and went to Middlesex High School in Twickenham. After the war she worked for solicitors in London, later married (Peggy Longman) and lived in Southampton. I lost contact, but I believe she died about 1990. I should be pleased to hear if anyone remembers anything about her. I was born in Wymering, and I have lived in Wymering, Paulsgrove, and Portchester all of my life. I started my working career as an apprentice joiner at ARE Portsdown, and I worked there, and in the tunnels at Fort Southwick, for over 5 years. We had a workshop in ARE, where the driving centre is now situated at Fort Southwick. When I was an apprentice the Overlord Map was on the wall in the tunnels, another apprentice and I used to sit on a wheeled chair (as tall as a tennis umpires chair), and push each other up and down pointing out the landing beaches. The map is now in Southwick House, and it was supposedly there throughout the war, but if you have a look at the painting of the map you can see curved girders at the side, these were the tunnel supports where it was really situated. I suppose it seems more heroic and romantic to think the that D-Day was run from a country house, and not underground!. After I completed my time as a joiner, I entered the Drawing Office of the Ministry of Public Buildings and Works and I know why the houses had to be demolished in Hillsley Road!. 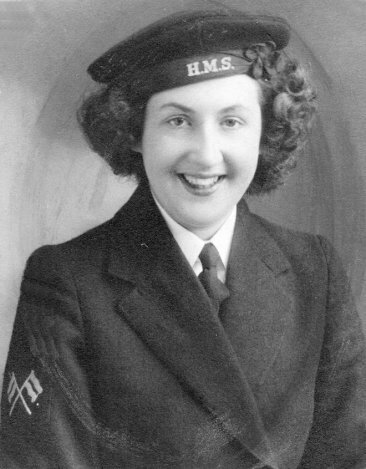 My mother, Leading Wren June Evelyn Tollfree, was a WRNS Teleprinter Operator (TPO) there and I remember her telling me the girls who'd been on watch that night told them D-Day was postponed to 6th June so as they were on watch that night they'd be the lucky ones. Hence my mother's memory of things being all rather quiet until a tall US officer ran through the tunnel at 0030 on 06/06/1944 declaring "They've landed! They've landed!" and then all hell breaking out as the volume of signals went through the roof! As it happened, my mother's 20th birthday was on the 8th June 1944. She used to tell me that they had to be escorted to/from barracks by Royal Marines, because of the nature of their work at Combined ops HQ, and were not allowed leave in the weeks leading up to D-Day for security reasons. She also remembered how they had a concession allowing them to wear sailor's bellbottom trousers underground instead of skirts, in view of the damp in the tunnels. A luxury on night watches was to have some of the fat off the inside of the lids of large corned beef tins melted on top of your cocoa, but that required careful chatting up of the hands in the galley, so she said! My mother used to recall how while Wrens weren't subject to King's Regs it was made pretty clear the dire consequences of typing something incorrectly. She said that while only officers were allowed to encypher, ratings did coding. I have known Marie Scott for over 60 years - she recently recounted the attached story which may be of interest to you. I served in the WRENS on the switchboard of the UGHQ at Fort Southwick from March 1944. I was on duty on D-Day (I was 17 at the time and didn't become 18 until 22 days after that momentous day), I am afraid that my memories of the minutiae of life in Fort Southwick have largely vanished, but I vividly remember being on duty on D-Day and I was manning what I believe was merely referred to as a VHF set. We were in direct contact with the troops on the Normandy beaches and I distinctly remember hearing gun-fire in the background. (If anyone could either confirm, or refute, this recollection I should be most grateful). I remember the endless flights of steps to reach the tunnels and the claustrophobic atmosphere down there. In fact, after some time, the authorities realised we were being deprived of sunlight and we had sessions of sun-ray treatment. However, when we were off-duty we certainly knew how to enjoy ourselves ! As all three services were represented at the Fort, I made friends with ATS girls as well as WRENS; two in particular spring to mind - Daphne Dawson and Jean Rowse (whose wedding photo I still possess). Of course there were also many WREN friends amongst whom were Iris Negus, Brenda Wright, May Reading, et al - where are you now ? I certainly remember when King George VI came to SHAEF as I was in the WREN's contingent for the march past. Although I seem to recall our marching prowess wasn't a patch on that of the ATS and WAAF personnel who had to do compulsory drill every day (?) whereas we WRENS only marched on special occasions ! As far as our personal quarters were concerned I was lucky enough to be billetted at Heathfield House, just outside Fareham. This was a wonderful old house set in its own grounds and boasting a walled garden and, I believe, an orchard. The owner was an elderly lady (well she she seemed elderly to me at the time) who was somewhat eccentric as she walked around smoking a clay pipe ! My 'cabin' (No 6) was in the private part of the house where the owner still lived, so we saw her quite often. She even gave me my first experience of eating a mandarin, grown in her own garden. Needless to say, sixty years on from those historic days I am extremely proud to have been a minute part of those great events. My name was Gladys Seed (now Dutton) and I was a Wren at Fort Southwick and I was there during D-day. Veronica Owen sadly died a few years ago. I have not heard from Christine for many a long year but she was a good friend of mine I married into the Army 54 years ago but my husband died 4 years ago. I now live in Somerset. Veronica Owen and Christina Guthrie and I were three of the Wrens who were billeted at a requisitioned house in Fareham. We were taken on duty (night or day) by a coach which took us to Fort Southwick. I happened to be on duty on the night of D-day when an officer from the Ops Room came to tell us that this was the night for the invasion. We had no signals to decode at all and everything was very quiet. When we went up those famous steps at the end of our night duty my memory is of lots and lots of boats going over to France but my memory may be wrong because others have said that there were no vessels to be seen. For many days beforehand the roads were full of American jeeps and American soldiers under canvas in various places. They were always so cheerful and friendly - little did the poor fellows knew what it would be like for them . I am 80 years old now so my memory of those days is dimmed with time. I was very grateful to receive this email from Alison Edye because it now means that all three forces of the UK Armed Forces are now represented on this page: WRNS - Royal Navy, ATS - Army and WAAFs - RAF. In May '44 I was a WAAF [Womens' Auxiliary Air Force] Cypher Officer posted to the Fort. There were three of us and we were obviously a backstop. We had to familiarise ourselves with all the beach cyphers and codes for all three services, so we had a lot of work to do. As for everyone in the Tunnel, life consisted of working and sleeping - and of course THOSE steps. It was an extraordinary place - there were hundreds of people and the stairs could be like a rush hour escalator sometimes, yet, apart from those moments one seldom saw anyone else. 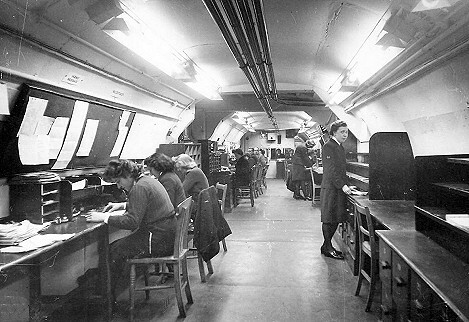 I have no memory of the RAF teleprinter Room but I can only suppose that, on the principle that all cats are grey in the dark, I was so used to seeing teleprinters in action that I didn’t find it surprising unless the uniforms were a different colour. What does seem rather odd is that I never saw the light blue [RAF] anywhere inside or outside the fort, yet they must have been billeted somewhere. But your photographs brought back the atmosphere of those little rooms with their curved, whitewashed walls - it was like being in a honeycomb with all the other busy bees! Daylight lighting was not at all as good as it is today and I suffered from eyestrain quite badly after three weeks or so intensive close work The sentries , up in the real world at the entrance, were used to anything by the time they had watched a few hundred people staggering by after the climb, but, as far as I know, I was the only one to have tears streaming down her face. Pride made me inform them that it wasn’t the stairs, but the Sunlight that was too much for me. But I don’t think I was the only one to shed a few tears when the dawn broke on D-day morning. It was very exciting and terribly tense during the first days of June. But on the 6th the moment came, suddenly, when we realised there was absolutely nothing more that we could do . There was a feeling of silence and emptiness and in the dawn I climbed up to lie on the grass roof of the fort and waited - all thoughts on the thousands of men crossing the channel. I have always been glad of those few hours. Then the sound of wave after wave of aircraft filled the sky with noise and I think I heard the big guns from France and knew the end had begun. I have vivid memories of Fort Wallington too, where we were quartered among a lot of rather senior Naval Officers. The conversation I had with Doris Buttle was one of the most pleasant I can ever remember having. Despite being 80 years old she has vivid memories of her wartime past and a captivating and articulate way of recalling them. She is justly very proud of her service to her country and is anxious that those dark times are not forgotten. My story goes back to the beginning of the war. I was 15 yrs old when it was declared in September 1939. Too young for the forces at that time, but when I reached 17 years old I went to Bristol and volunteered. When asked my age I told them I was 18 .No questions were asked at that time. When I reported back from embarkation leave, at the beginning of 1944, I was told to report to a house in Victoria [London]. Then I was sent to Hampton Wick, near Bushey Park, where I was under canvas, and that was where Supreme Headquarters Allied Expeditionary Force was formed, with the sole purpose of planning D Day. I stayed there for a few weeks, and then was sent, with a few other girls, to Fort Widley at the top of Portsdown Hill. Every day we were taken by 3 ton truck to Fort Southwick. We operated the switch-board in the ops room, which was 100ft down in the bowels of Portsdown Hill, euphemistically referred to as "The Rabbit Warren" There seemed to be hundreds of steps down to the ops room. We knew by the heavy work- load on the board that something was being planned. I was not to know when I reported for duty at 20:00hrs on the night of the 5th. June1944, that the events of that night would be the turning point of the war. There were 9 operators in duty, 3 A.T.S., 3 W.R.N.S.and 3 W.A.A.F. I was one of the A.T.S. For one night only we were Combined Ops. In the build up to D-DAY we were extremely busy and as we travelled along the top of the hill and looked down into the bay and to Langstone Harbour, all we could see were landing craft. The barrage balloons were low down and we had a feeling that something momentous was about to happen. Nobody left their positions, we were all keyed up and waiting. The beginning of the shift was extremely busy, and then there was a lull until the early hours when a call came through for Churchill [Winston Churchill the Prime Minister], which I connected on a scrambler. This was a device, which enabled people either end to hear each other but was jumbled in the middle. Nobody could have made sense of the conversation if they were listening in. When at 08:00hrs the following morning I finished my shift and climbed all those steps to the surface, I felt an eerie silence. It was uncanny, Thorney Island and the entrance to the Harbour [Langstone Harbour], which had been full of landing craft the previous night, were now empty, not a soldier nor a ship in sight. All the barrage balloons were high in the sky. As I entered Fort Widley a soldier called to me " Hi Brownie, what happened last night?" "Nothing" I replied "it was a very quiet night" and went to bed. I woke up at 13:00 hrs to hear of the invasion on the News. There are times, even in war, when we bend the rules a little. Men would call us from the front line [in France] and ask if we could tell their wives that they were O.K. (We were the first contact for these men). Can you imagine the tears of joy when I rang and said, " You don't know me , but John (or whoever it was) was O.K.? " I stayed at Fort Southwick until the 28th of August 1944 when I went to Northolt and the next day flew out in a Dakota to Paris. I was amongst the first ten girls to land in the mud at Orly Airport in Paris on the 29th of August. Just 4 days after it was liberated. But that is another story!!!! Although they were very hard working conditions in the " Rabbit Warren" we had some lighter moments. The food was so atrocious at [Fort] Widley that occasionally we would scramble down the side of Portsdown Hill and treat ourselves to an egg and bacon breakfast at a house in Cosham. It cost us 2/6d out of our princely sum of 9 shillings a week. It was fine going down , but oh! Coming back !!! but so much better than the Marge in an empty sardine tin on the mess table. ...I served at Fort Southwick from May 1943 to July 1945 as an S.D.O. watchkeeper ( SDO = Signals Distribution Office ). We were responsible for recording and distributing all signals to and from the Commander in Chief Portsmouth. I was an ordinary Wren, but very proud of it. Our office was surrounded by coders, WT, teleprinter and telephone rooms, and of course it was manned 24 hours a day. The layout plan [on page 1] shows no indication of the SDO. I would place it at 21, with plotting room at 15, coders at 20, and WT room at 22. There was definitely no Wrens' rest room! [formerly shown at 72 on the plan] But there was a room, on the far side of the plan, where we slept for a few hours during the night after we had changed to a 3 watch system during the run-up to D Day. Previously on a 4 watch system we slept in huts on the surface ( this was on a quick changeover night, we were actually quartered at Fort Wallington [at Fareham]). The visit of the King took place in about September 1944 ( there may have been confusion with his visit to Normandy, which did take place about a fortnight after D Day). He visited the tunnel then afterwards took the salute on the main road while those of us not on duty marched past. [see next page] Then he gathered the marchers around him and thanked us, in a scene reminiscent of Noel Coward in "In Which we Serve". It is 60 years since those days, but it is impossible to forget such historic times. Thank you for keeping them alive. 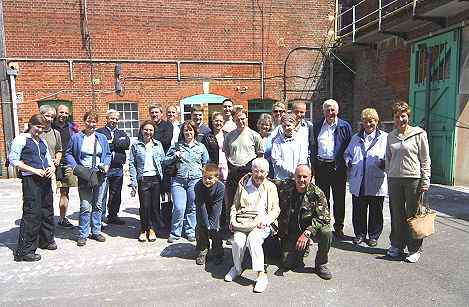 On 5 June 2004 as part of the D-Day Commemorations I organised a tour of the UGHQ and the fort on behalf of the Fort Southwick Company Limited for Fort Southwick veterans and their families. Pictured in the foreground seated is Elsie Horton (see above text) and kneeling next to her on the right the PORTSDOWN TUNNELS author Bob Hunt. Around her are many members of her family. She was 80 the day before and managed the 168 steps of the UGHQ with ease!